Experience and common—sense are the most valuable guides when actually fishing. No two days are alike, and at each step the fisherman will most likely be confronted with an absolutely new combination of circumstances. This is perhaps one of the greatest charms of dry fly fishing. To read is good, because it shows from the personal knowledge of others that no two experiences of the same writer are absolutely alike, and no hard-and-fast axioms of fishing lore can invariably be followed. The attendant circumstances should guide the immediate actions of the moment. There are, however, certain truths and axioms which occur to me and which the beginner might do well to remember; they may perhaps be tinged with a personal colour, for they are the results of my own fishing experience. The fisherman should always remember that nothing succeeds like success, and if he believes in the fly he is using he is more likely to be successful than if he is doubtful as to its virtues. The suggestion that the fly he is using must be the best assists him while fishing. I can even imagine a day’s salmon fishing to be interesting from start to finish in spite of the fact that no salmon have come at the fly, if the fisherman himself believes that his fly is the only one that will kill at the time. It really means that the suggestion of infallibility aids the fisherman in that continuation of attention which is so necessary to the purpose in hand, i.e., to attract the attention of the fish. I think myself that there is no fly like my own “Fancy,” and while a certain amount of optimism may be allowed because of the success I have attained with it, at the back of my brain I know full well that some at least of its success is due to the suggestion of its infallibility. The beginner, he who has been badly taught, or the self- taught man who may have acquired bad habits, fails to understand why his friend catches readily and easily fish after fish, during a long day, while he secures but a few, if any. The skilful fly fisherman, who can take every rising fish within his reach, seldom attributes his success or his friend’s failure to the real cause, which is, the certain and immediate skilfulness or unskilfulness of each cast. The dry fly fisherman, for instance, has, as a rule, only one opportunity at each fish, and it is with him that the making or marring of that chance rests. Each initial cast for a trout possesses a greater or less difficulty, and his success will depend on the immediate and skilful manner in which he takes advantage of the opportunity. The most essential portion of the dry fly fisherman’s art, and the most difficult to acquire, is the power to place at once and with certainty the right fly, delicately and accurately, over his fish. Among the many factors which contribute to the happi- ness of any day’s fishing, the killing of the fish is an incident which ranks least. The best fisherman in my opinion is he who nets most fish, and who kills or injures the least. There can be no harm in filling one’s creel if its contents are employed in “pleasuring some poor body” as Izaak Walton has it, but to effect the depletion of a trout stream for no other purpose than that of proving one’s skill, and to toil during the day under a creel loaded with those beautiful fish in order to establish our own prowess on our return to our fishing quarters, is a vanity which calm consideration should soon permit us to conquer. A fisherman’s day may be considered to be one on which trout are difficult to capture. A duffer’s day may be considered to be one on which the fish are superlatively easy to capture. It should always be remembered that the killing of a two or three year old fish puts an end to the most valuable and interesting period of its life. Always be charitable; never discredit a reputed trout stream because you have been unlucky on one or two occasions. “No fish in the river” is a rash statement to advance, because, after one or two visits, no fish have been caught, or possibly seen. A futile visit to a stream and a hasty opinion thus formed may be regretted. I remember, by the kindly courtesy of a French landowner in Normandy, taking a day on his stream, in which he told me were many trout. I had been doing well all the week, but on this day I had the poorest luck, and, therefore, hastily concluded that the stream was almost barren of trout. Consequently, on one memorable day on which the May-fly was dominant, instead of going with a friend who was fishing this stream, I went farther and fared worse, and found, on meeting my friend in the evening, that he had enjoyed a glorious day’s trouting. I still regret losing that excellent day, and consider that, as regards any water, first impressions are not always the soundest. The golden hours of a trout fisherman’s experience will be from l0 a.m. to 3 p.m. It is during their first rise, i.e., during the period when they first come on the feed on any day, that most trout will probably be taken. You may miss this rise! As the big fish rise most frequently in a slow and dignified manner, their rise is generally of a less disturbing character than that of a young, eager and voracious youngster. The splash made by a big fish may be less, but the wave will probably be bigger; nevertheless to the unobservant or inexperienced fisherman the difference is not easily discernible. The musical, sucking noise of the big fish, when feeding at night on surface food, is unmistakable. Do not press in fly casting. Use the least possible force in order to achieve your best cast. If it be possible always keep a taut line after a fish is hooked. Play your fish from the reel if possible. Keep your rod well up when playing the fish. A constant and delicate strain on the line secures a lightly hooked trout, which otherwise would be lost. Always remember that in very weedy water it is better to let a trout go up-stream into the tail of a bunch of weeds than to pull him down-stream, and let him get sideways into the thick of such a danger. A fish which may seem hopelessly entangled in weeds and brushwood may with patience and nerve be ultimately creeled. When about to net or gaff your fish, use your reel as little as possible. Your man, your rod, your reel, and yourself, should be as still as a heron at that critical moment. Look to the point of your trout and salmon hook frequently, and always carry a small file in case the point becomes blunted. Avoid casting directly over a trout if possible, but get your fly above and within range of the trout’s vision as soon as possible after one has risen. 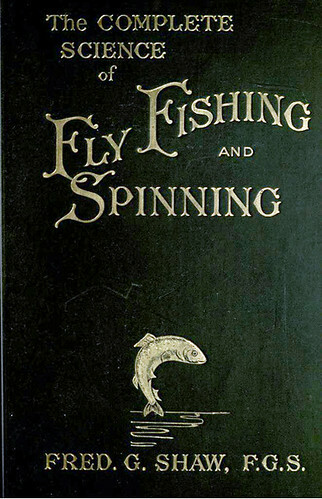 In the ordinary run of a stream when a trout is seen rising, so long as a fly floats into the circle which bounds its upward vision, and so long as the line does not immediately bisect the circle when fishing upstream, the angler may rest assured that he has done all he can do when he casts to a spot immediately above the circle of the rising fish. If immediately below your fish the line can be thrown in a curve, so that while the fly alights immediately above your trout, the line will curl over to the right or left of the trout’s position. As the cast falls on and breaks the surface of the water, it will be visible to the trout, but it is not so likely to scare the fish as if it had fallen immediately over its head. Run your dry fly line through your grease pad at least twice during the day’s fishing — but only when the line is dry—once before you start, and once after the pause for luncheon—take off any superfluous grease by running the line through your handkerchief or any dry rag. If too much grease be put on the line, it hinders its easy running through the rings of the rod. Keep the point of your rod down when fishing. The less slack line there is between your rod point and the fly, the better will be your strike and the greater your command over the fish you hook.